When news broke that President Trump had chatted with Russia President Vladimir Putin in a previously undisclosed meeting for an hour at the G-20 summit in Germany, it was another reminder that much of the information about the president's whereabouts and policymaking comes from sources outside the White House. 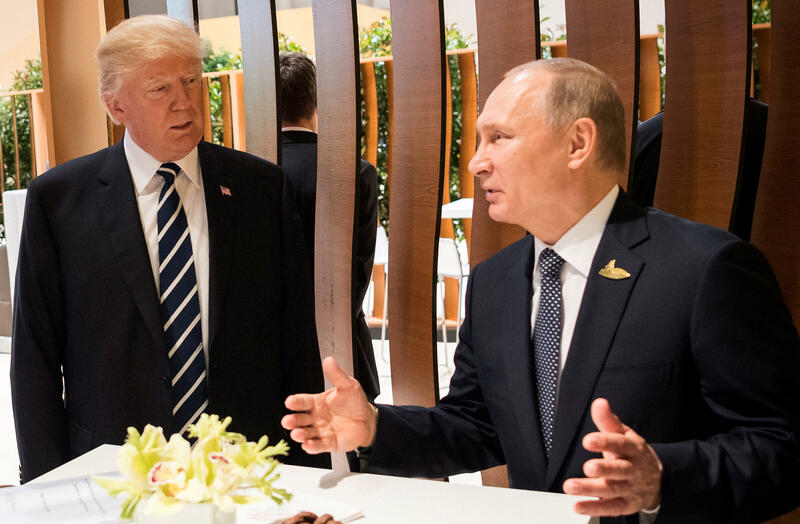 The scant details of the unusual meeting between the leaders of two traditionally adversarial nations were reported by Ian Bremmer, president of the Eurasia Group. He talked about the Trump-Putin tête-à-tête during an appearance on "The Charlie Rose Show." The meeting had not been mentioned by the White House press office, senior administration officials, or Mr. Trump himself. The White House said it wasn't trying to keep the meeting under wraps, though, and later released a background statement saying the "insinuation that the White House has tried to 'hide' a second meeting is false, malicious, and absurd." Since Mr. Trump took office in January, White House reporters -- and by extension the American public -- have on more than this occasion received more detailed information about the president's conversations and whereabouts from foreign governments rather than from official channels in Washington. This is something at least one former White House official finds troubling. "These conversations do not belong to President Trump, they belong the country," one former Obama administration official told CBS News. "He's there as an elected representative and these conversations should be part of the historical record." Here are a few examples of how the White House has allowed other governments to fill in the blanks about Mr. Trump's conversations with foreign leaders. At the recent G-20 summit, American reporters first learned details of the first encounter between Mr. Trump and Mr. Putin through the Russian News Agency TASS, which is owned by the Russian government, when Kremlin spokesman Dmitry Peskov announced to reporters that the two presidents had shaken hands and "would soon hold a separate meeting." After that two-hour meeting, Secretary of State Rex Tillerson and Treasury Secretary Steven Mnuchin provided reports with an off-camera, audio-only press briefing in which Tillerson told reporters that on the issue of Russian interference in the 2016 election, the two "agreed to exchange further work regarding commitments of non-interference in the affairs of the U.S. and our Democratic process as well as those of other countries." In contrast, Russian Foreign Minister Sergey Lavrov, who also attended the meeting, strolled out to hold a live, on-camera press conference, where he announced that Mr. Trump had accepted Putin's assurances that Russia did not meddle in the 2016 election. The next day, White House reporters noticed a slate on a live TV feed of the G-20 summit that indicated Mr. Trump was scheduled to hold a press conference in the afternoon prior to departing Hamburg for the U.S.
Russia expert: Trump's dinner chat with Putin "high risk"
An hour later, after much confusion among the White House press corps, which was somewhat absurdly attempting to track down the president's schedule, U.S. reporters were notified that the president would not be holding a press conference. Mr. Trump may have avoided the cameras, but Putin welcomed them. When he held a press conference later in the day, Putin told reporters that it was his opinion that Mr. Trump was satisfied with his denial of the alleged election interference. The U.S. intelligence community released a report in January concluding that Putin meddled in the elections. "He asked a lot of questions on this subject, I was able to answer -- answered all of these questions," Putin said of Trump. "I think he took this into consideration and agreed. But, in fact, how he reacted to this -- ask him." Putin also told reporters that it seemed to him, based on his meeting with Trump and their agreement to establish de-escalation zones in Syria, that the U.S. had "become more pragmatic." The bewildering information flow at the G-20 was not a new phenomenon for White House reporters. Earlier in May, the Trump administration welcomed Lavrov to the White House. He visited Mr. Trump at the White House after a meeting with Tillerson. The meeting was closed to the White House press pool. But shortly thereafter the meeting, handout photos emerged, showing Mr. Trump smiling and apparently joking around in the Oval Office with Lavrov and Russian Ambassador Sergey Kislyak – a man at the center of the investigation into former National Security Adviser Michael Flynn's ties with Russia. The photos were distributed not by the White House, but by Russia's foreign ministry and its embassy. The Washington Post reported that a photographer for TASS had been allowed into the Oval Office, something U.S. intelligence officials viewed as a potential security breach. It also came to light that Mr. Trump revealed classified intelligence provided by Israeli to the Russians. Readouts of President Trump's conversations released by the White House press office have repeatedly skimped on policy details, especially in comparison to readouts from other governments. On June 20th, there was one notable word missing from the White House's release of Mr. Trump's call with Ukrainian President Petro Poroshenko: Russia. "President Donald J. Trump met today with President Petro Poroshenko of Ukraine to discuss support for peaceful resolution to the conflict in eastern Ukraine and President Poroshenko's reform agenda and anti-corruption efforts," the one sentence statement released by Press Secretary Sean Spicer's office read. But Ukraine had more details to divulge. "The validity of the U.S. sanctions against Russia will be prolonged," read the specific and lengthy readout of the conversation provided by Poroshenko's office. Earlier in the year, in April, the White House detailed Trump's calls with United Kingdom Prime Minister Theresa May and German Chancellor Angela Merkel of Germany. The press office did note that the leaders "agreed with President Trump on the importance of holding Syrian President Bashar al-Assad accountable." But again, the statement omitted a point of discussion that Merkel and May's office both revealed: Russia's role in Syria. "The Prime Minister and the President agreed that a window of opportunity now exists in which to persuade Russia that its alliance with Assad is no longer in its strategic interest," May's office wrote. In February, Mr. Trump spoke with Argentine President Mauricio Macri for the first time over the phone. Mr. Macri's office distributed a fairly lengthy readout of their call later that afternoon which stated that during the five minute long call, Mr. Trump had "reiterated his invitation to meet later this year in Washington," and that the two discussed Venezuela and the region. "The dialogue between the two was very cordial and showed the agreement between the two," the statement, translated from Spanish, read. A full day later, the White House released a vague three sentence statement with little detail. Also in February, reporters learned of the details of a call between President Trump and Nigerian President Muhammado Buhari from his spokesperson's tweets. "Pres. Trump assured @NGRPresident of the US readiness to cut a new deal in helping Nigeria in terms of military weapons to combat terrorism," one of the tweets stated. That was likely referring to a $592 million dollar arms deal that had been in the works with Nigeria until the Obama administration put on hold on it, after the Nigerial military unintentionally bombed a refugee camp. The Trump White House did not provide a readout of the call. Sometimes, the White House has not provided any guidance for Mr. Trump's meeting with another world leader at all. May 11, the Russian Embassy's press secretary flagged pictures of Mr. Trump meeting with the Ukrainian Foreign Minister Pavlo Klimkin in the Oval office, tweeting that "the MSM will never find & show. Courtesy leaked by Ukrainian colleagues. Everybody furious." The pictures of Mr. Trump with Mr. Klimkin were posted by the Ukrainian Foreign ministry. Contrary to the Russian spin that the media had deliberately ignored the meeting, it was not on the President's White House schedule, nor was press invited to cover it. In April, Mr. Trump met with two former presidents of Colombia at his Mar-a-Lago club in Florida, which was only revealed by a McClatchy report. The secret meeting came a month before current Colombian President Juan Manuel Santos was to visit the White House. The meeting was not disclosed by the White House to reporters nor was it on the president's schedule however former President Andres Pastrana thanked Mr. Trump for a "cordial and very frank conversation" about issues in the region on Twitter. Sarah Huckabee Sanders later dismissed the encounter as a "quick hello." Foreign governments have not shied away from pushing back on the White House for peddling unverified statements that have in some cases started diplomatic rows. Just last week, after a press briefing about Donald Trump Jr.'s meeting with Russians at Trump tower, Sanders said the DNC colluded with the Ukrainian Government to help Hillary Clinton and leak damaging information on one of Trump's campaign manager, Paul Manafort. The Embassy of Ukraine disagreed, saying in a statement that Sanders was "misinformed." "While some politicians who are not part of the Ukrainian government might have taken sides during last year's elections in the U.S., the government of Ukraine did not," the Embassy wrote. But Spicer and other Trump surrogates have continued to repeat the claim, undercutting the administration's support to Ukraine in recent months. "We would like to reiterate that the Embassy of Ukraine has neither coordinated with the DNC on opposition research nor taken any actions to undermine campaign efforts," a second statement from the Embassy read. And in March, Spicer suggested that then-President Obama had wiretapped then-candidate Trump through the GCHQ, Britain's intelligence agency – a claim first made by a Fox News commentator. In a break from normal practice, GCHQ released a public statement calling the allegations "nonsense" and "utterly ridiculous." Prime Minister May's spokesperson said that she "received assurances that these allegations won't be repeated and this shows the administration doesn't give the allegations any credence." Publicly, Spicer maintained that he was "merely reading a story that's in a paper" and was not vouching for the story.